Where it is not possible to install physical safety systems such as non slip stair nosings or entry mats, Latham offers a variety of products that can be retroactively applied to existing infrastructure to improve its safety as well as being ideal for surfaces such as stairways, ramps & platforms. In most cases, these flooring systems can be applied by hand or by using straightforward application tools such as rollers, brushes, or trowels. This provides a low cost and simple solution to improving the safety of existing flooring systems. 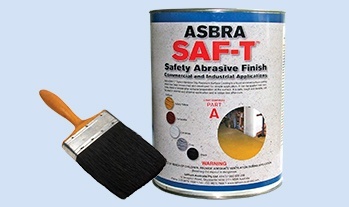 The Asbra SAF-T Safety Abrasive Slip Resistant Surface Coating is a liquid abrasive surface coating that has been specifically designed and developed for simple application. It is a cost effective safety coating that can be applied in minutes over concrete, metal or timber after suitable preparation of the surface. The coating is safe, tough and durable, can be used in internal and external applications and is odourless after cure. The product is designed to be installed on flat floor services but can be considered for curved stairs when the radius is tighter than can be achieved with products such as Asbraloy or Asbrabornz curved tread. For all other applications, we recommend stair tread nosings. The standard Standard SAF-T colour is safety yellow but is available in a range of five colours to accent or suit a variety of applications. Latham Asbra Titazel ST is a heavy duty slip resistant trowelable resin for commercial applications. 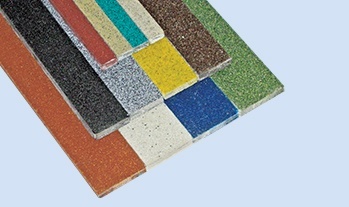 It features an abrasive granule for floor surfacing, tread surfacing and tread bars. It is supplied standard in Suregrip Sparking Black, with the option at additional cost for special colours including grey, buff, brown, terracotta, green, off white, and safety yellow. The recently updated AS 1428.4-2009 indicates a strip of contrast colour 50mm-75mm wide be applied to the edge of the tread with a maximum set back of 15mm. It should be noted when using Asbra Titazel ST that damaged or cracked concrete floors should be repaired before application. These safety strips offer an instant, self adhesive slip resistant safety surface. They are designed for light duty and temporary commercial applications. The strips are made from high quality raw materials and consist of several individual layers that are permanently bonded together to produce a single, long lasting heavy duty slip resistant surface. 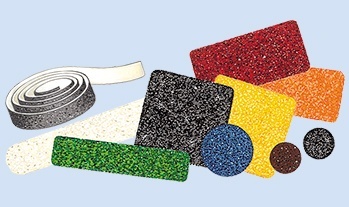 The top layer of near-diamond-hard abrasive grit is secured for long life by a flexible polymeric binder and bonded to a durable flexible plastic substrate. The pressure sensitive adhesive with high bonding properties is protected by a poly-coated Kraft release paper. To install the strips, all that needs to be done is to prepare the surface, peel off the backing, and stick down. It’s that simple. No messy glues or separate adhesives are needed. Suregrip Slip Resistant Paving Grain can be applied to a range of surfaces to improve grip and safety. Typical examples of applications are to areas of paving, stairs, landings, ramps, loading docks, patios, factory floors, schools, shopping centers, or parking stations. The iridescent sparkle of Suregrip’s silver-black particles also creates an attractive appearance and helps to subtly indicate that the pavement is slip resistant. 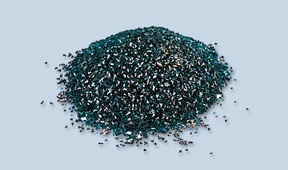 The pure silicon carbide mineral granules are specially treated, crushed, washed, classified and graded to ensure complete uniformity for effective application. The granules are produced in an electric furnace at temperatures exceeding 2200° C, resulting in a hardness second only to that of diamond. The granules are extremely durable and chemically inert so are not affected by water, common acids or alkalis, providing years of improved grip for foot traffic. Asbra Mall Bars provide an attractive safety option for ramps, tiles and cement toppings. They are not recommended for installation in rebated grooves in marble, granite, stone, terrazzo or timber treads. Instead, metal supported products or resins such as Titazel ST Trowelable Resin Safety Tread should instead be considered. The standard available length is 1000mm, with longer lengths available on special order. The standard colour is sparkling black. Optional Supagrit colours are also available at extra cost. These abrasive studs provide a safety alternative to other strip-based solutions, providing an attractive option for stair edges. Each abrasive stud is clad with approximately 2mm thick aluminium. They are available in a range of colours for insertion into predrilled holes in timber, concrete or stone. 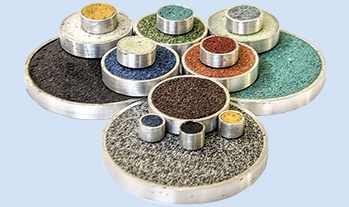 The systems have Latham Standard Slip Resistant Silicon Carbide Mineral Inserts for safety. Where these are being considered for installation on stairs as a slip resistant treatment, we suggest that the studs are installed no further apart than 50mm to ensure that the pedestrian’s foot is on a stud at all times. 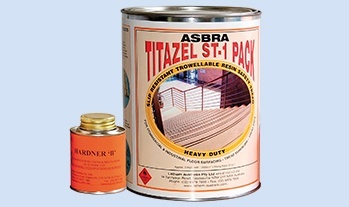 The Aluminium Clad Abrasive Studs should be installed using Titazel Thixotropic adhesive. Have a question about your upcoming project or requirements? Use the form below to get in touch and one of our consultants will get back to you as soon as possible. Please fill out the below details to receive your complimentary download. © Copyright 2018 — Latham Australia. All Rights Reserved.